Roger Allam is also astonishing as Jenkins. He not only has the receding hairline – can that really be a wig? – and the soft “r” sounds but the sensation of a man only really comfortable, as a historian once said, “at high office or at high table”: even to watch Allam’s faint look of distaste at the prospect of macaroni cheese is a delight. 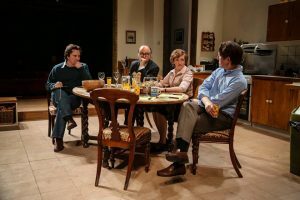 (…) and features a super performance by Roger Allam as the lisping and pompous patrician Jenkins, who is more interested in wine (yes, Debbie has acquired a bottle of Chateau Lafitte) than press releases. Allam manages to infuse phrases such as “I am replete” with just the right amount of comic absurdity. It does boast some masterful performances. Roger Allam is particularly good value as Jenkins, alert to the man’s tics of speech and oratorical style. Acting from the five-strong cast – Roger Allam as Roy Jenkins, Debra Gillett as Shirley Williams, Tom Goodman-Hill as David Owen, Paul Chahidi as Bill Rodgers, plus Nathalie Armin as Owen’s publicist wife Debbie – is superb. A barely recognisable Allam, his hair ensconced under a polished dome, is particularly brilliant, perfecting Jenkins’ mannerisms and speech impediment to wonderful effect, making him at once a figure of fun and a respected elder. (…) Then Roger Allam as Roy Jenkins: mightily comic as he sniffs the clawet cork, wemarks on the “cwepuscular gweyness” of Bwusssells and looks round for a flunkey to take his coat. But also delivering with stirring conviction a pivotal childhood episode. These performances carry Polly Findlay’s bright production from a beginning in light caricature – perhaps towards a West End life? 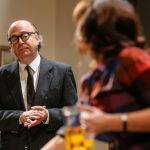 The star of this show is Roger Allam, whose Roy Jenkins is a study in pampered vanity. Playing Jenkins, a man celebrated for both a speech defect and rococo cadences, Roger Allam has no choice but to deliver the voice perfectly, which he does. Waters carefully gives the character an early riff about the “crepuscular greyness” of Brussels, allowing Allam to establish the w-sounds and extravagant adjectives. Actor and playwright also challenge the assumption that for Jenkins both to love fine wine and to advocate social justice was inevitably a contradiction. I’m a huge fan of Roger Allam – such a sublime actor. I tried to get tickets for Limehouse but they were sold out! I’m now beyond any consolation…..
Keep an eye on the Donmar Warehouse Twitter account! Every Monday at 12 pm they release #KLAXSON tickets, and they will also notify you when there are returns for the day. (There is also the Young + Free scheme, and you can always call the theatre to ask for standing tickets). Good luck!